This is one seriously oversized bottle of Champagne from Pol Roger. The Balthazar holds a whopping 12 litres of Champagne and this bottle comes to you in a Pol Roger Champagne branded wooden box. Founded in 1849, Pol Roger is one of only a few Grande Marque Champagne houses that remain family owned and operated. At first Pol Roger bought in all of the grapes to ferment into wine from local growers but such was his early success that he soon began to buy vineyard holdings. Although the business started without an inch of vineyard to its name, it gradually acquired land of its own and now has over 87 hectares of vineyards, across the Champagne region, with the majority being close to Epernay and the Cote de Blancs. Carrying on from his father Pol, Maurice Pol-Roger is the real man behind the brand, and is largely responsible for elevating the brand to where it is today. Pol Roger Brut Reserve Non-Vintage is a blend of 30 different wines from at least two vintages. 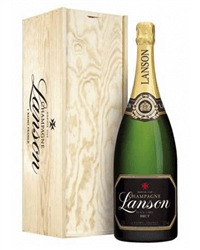 This champagne made from equal parts of Chardonnay, Pinot Noir and Pinot Meunier, is consistently one of the very best on the market, largely due to the high proportion of aged reserve wines in the blend. 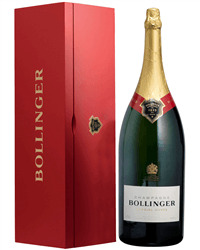 It's well known Churchill was partial to a glass of champagne, Pol Roger in particular. Pol Roger is one of the smallest estates in Champagne, but its top cuvee named after Sir Winston Churchill gave the brand international recognition and prestige. The precise blend of Sir Winston is a family secret and is produced only in the finest vintages. Champagne Pol Roger has built an enviable reputation for its quality and is regarded by wine critics as producing one of the top 6 non-vintage Brut champagnes. 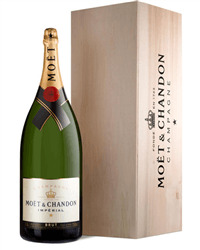 With its elegant white foil Pol Roger is the perfect brand to send as a Champagne gift. 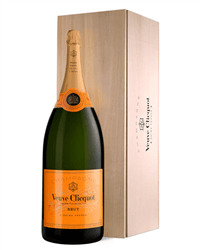 Send a fabulous Balthazar of Champagne pouring 96 glasses each. 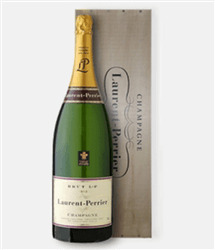 Our range of Balthazar of Champagne gift - 12 litre bottles includes champagnes from Laurent Perrier, Lanson, Moet, Taittinger, Veuve and Pol Roger. Order online or by phone and we will deliver to the address of your choice, beautifully packaged in its own wooden presentation box.